Enviable elegance. 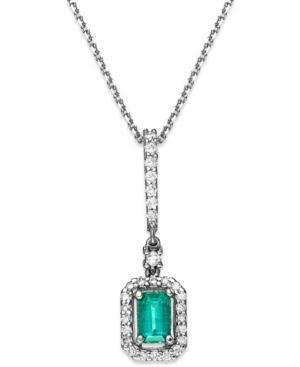 Crafted in 14k white gold, an emerald-cut emerald (5/8 ct. t.w.) centerpiece combines with sparkling, round-cut diamonds (1/4 ct. t.w) for covetable shine. Approximate length: 18 inches. Approximate drop: 1-1/8 inches.